We often get clients asking for a quote for their car to be 'valeted' or 'detailed'. In the world of professional car care, there are many levels of service so it really helps to know exactly what sort of service you would like. We have put together a short summary of options below so you can choose the most appropriate service. 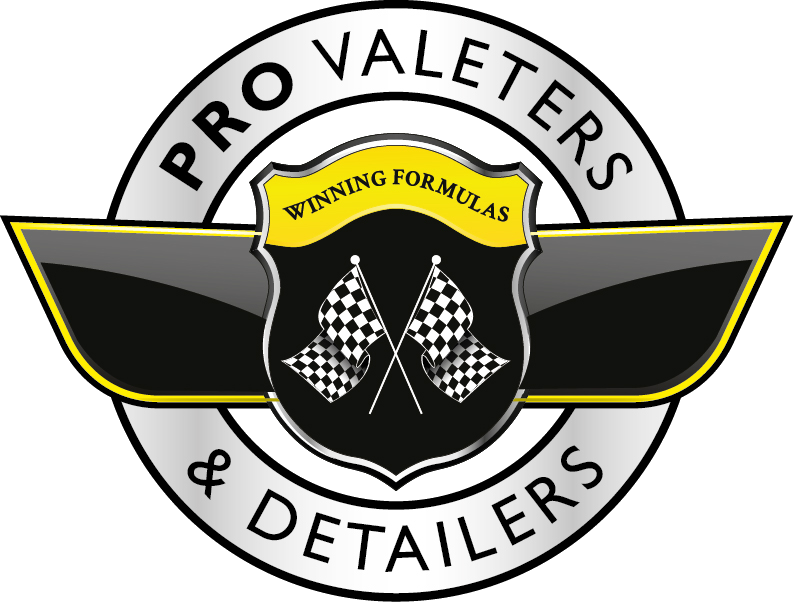 For valeting services many members will be able to provide you with a quote over the phone. Please try to be as accurate as possible when describing the condition of your vehicle. For detailing services, some members may ask to view and assess your vehicle prior to giving a quote. All PVD members have had their insurance checked (details on their profiles), and we check that they have positive customer reviews. We also remotely assess them to ensure they have suitable training and experience for the services they offer. Should you have a complaint, please contact us for help resolving it. Members have the option to take further assessments to ensure their skills are continually improving. There are ten modules, each with theory and practical elements. On completion of the first five modules, members can gain Accredited Valeter status. On completion of all ten modules, members are eligible for Certified Detailer status. Some PVD members will offer a basic wash service. This will include a pre-wash, three-bucket safe wash, and microfibre towel dry. The aim is to safely clean your car without damaging the paint. Depending on the level of soiling, equipment used, and methodology this would typically take 20-40 minutes. A Mini Valet will include the safe wash procedure as above, but add a level of interior cleaning. This can range from a basic vacuum and wipe-down of interior plastics, to more involved procedures. Generally these take between one and two hours to complete, though you may need to add paint protection or boot vacuming on top. A full valet is designed to clean just about every aspect of your vehicle, in some cases this includes a basic clean of your engine bay too. Depending on what is included, full valets can take between two and six hours to complete. You can also expect some form of paint protection such as a wax or sealant to be applied. Some professionals will have a Full Valet as their top service, others will have another service above it, such as a 'Platinum', 'Signature' or 'Luxury' Valet. Each will have their own menu of processes for their service, suffice to say that you can spend in excess of a whole day in order to thoroughly valet a car, particularly when heavily soiled. Light enhancements will include a full wash and decontamination of the exterior of your car - this alone can take 2-6 hours depending on the size of your vehicle and the level of contamination. The 'single stage' element refers to the use of a single compound allowing the removal of light defects. A single stage should not be confused with a single pass - a single stage enhancement will involve multiple passes and can take more than a day. Similar to a single stage, but detailers will use at least two pad and compound combinations, hence it is sometimes referred to as a 'Two Stage Detail'. One to 'cut' the paint, thus removing deeper paint defects, and a second to 'refine' the finish and bring back the gloss that is sometimes lost during the 'cut' stage. Depending on the size and condition of the vehicle, and the desired level of defect removal, this can take two to five days to complete. Few detailers offer a full correction detail as it technically should remove every paint defect present - which is sometimes not even possible, and can take so long that few clients can justify the subsequent cost. Typically this would include elements of wet-sanding and, if required, additional paint. Fully correcting a vehicle to a concours standard is considered the pinnacle of detailing, taking weeks to complete and costing thousands of pounds. Plastic headlight lenses can loose clarity and become hazed over time, in extreme cases leading to an MOT fail. Many car care professionals can sand, polish, and protect headlights. This improves night vision and thus safety, as well as restores the overall aesthetic of an older vehicle. If a vehicle has been smoked in, left unused for extended periods of time, or suffers from water ingress, it can smell unpleasant. Using a combination of deep cleaning and decontamination techniques, car care professionals can often permanently rectify these problems. More and more vehicles are offered with leather interiors, which can become ripped and discoloured over time. Many car care professionals are able to deep clean your leather creating a dramatic improvement. Some also offer a repair and recolouring service. Whether you are entering a arrive and shine competition or trying to sell your car for the best price, having your engine bay professionally cleaned and dressed can sometimes make all the difference. It is always important to protect delicate electronics too. If left on a vehicle, bird lime can etch into the clear coat or lacquer of a car, sometimes causing significant damage. That said, we often see owners using inappropriate methods to remove bird lime, often causing further damage. Car care professionals can advise you how to remove bird lime safely. Cars are often accidentally covered in paint, concrete, and other forms of seemingly irreparable contamination. In some cases these can be safely removed using specific techniques and chemicals, so it is worth consulting a car care professional before investing in a body shop repair. Small to Medium Area Repair Techniques can be employed by suitably qualified car care professionals to repair dents, scrapes, scuffs, and other marks, without the need for the car to be taken off the road at a body shop - some PVD Members can offer these services. As alloy wheels get larger and tyres get lower profiles, it becomes easier to accidentally kerb your wheels against a pavement. Many PVD members can assist with repairing and repainting them, and fitting special devices to protect them against damaging them again such as Alloygators. Concours preparation is a speciality for top detailers, with some PVD members gaining accolades at the likes of Salon Privé and Concours d'Elégance. If entering your motorcar into such a prestigious competition, you may need suitably experienced detailer to assist. Whether fabric or mohair, soft-tops need special care and attention to remain aesthetically pleasing and waterproof. Car care professionals can assist with deep cleaning and removing green marks, and even re-colouring and re-proofing the hood to look as good as new. Vinyl wrap technology has come on leaps and bounds in recent years. If you are looking to change the colour of your vehicle or perhaps just turn some chrome trim to matt black, this can often be achieved with vinyl. Some PVD members offer vinyl wrapping services. As cars get faster and heavier, their wheels and brakes are getting larger. Thus calipers are often more visible and affect the overall vehicle aesthetic. As brakes are exposed to high temperatures, the paint can break down and require restoring - some detailers can offer this service. Waxes and glazes are relatively quick and easy to apply, while the best waxes can last over six months. They can add a deep, glossy shine to your car and furthermore don't require hours of preparation work prior to application. Polymer sealants are as easy to apply as wax and have the benefit of potentially greater durability. They are also cost effective, costing less than £30 per bottle. Most new car protection services offered by car dealers use polymer sealants. Ceramic coatings offer more resilient and longer lasting protection than waxes and sealants. However, they can be difficult to apply, often require specific environmental conditions to cure, and machine polishing prior to application is essential for good results. Paint Protection Film (PPF) offers the ultimate protection for paint - they are particularly resilient to stone chips, and some versions offer 'self-healing' properties. However, they are also the most expensive form of protection, requiring real skill to apply properly. Whether it be wooden river boats, GRP sailing dinghys, or top-of-the-line carbon fibre yachts, they all have surfaces that can be polished and protected against the elements. Many PVD members have the skills and equipment to help. Aerodynamic drag is the bain of all aircraft, be it a single-engined Cessna or the latest turbo-fan Eurocopter. Some PVD members can help restore & protect your aircraft, they have the all-important airside insurance to do so. Caravans, campervans, winnebagos, and other recreational vehicles are usually constructed from glass reinforced fibre (GRP). Just like paint, these can be polished and protected by car care professionals. From a chrome-drenched classic bike to a rugged tourer, all bikes benefit from some TLC now and again. Some PVD members specialise in two-wheeled beauties and can offer a full range of aesthetic-enhancing services. Tractors, combines, drills, harrows, and just about any other agricultural equipment can be maintained by specialist valeters - be it in preparation for a show, lease return, or just to keep your kit in top order & reduce equipment failures. Plant machinery from mini diggers up to massive earth movers can be deep cleaned and protected. Professional valeters know the importance of keeping everything from hydraulics to bearings in top order. Regardless of whether it's a 7.5 ton rigid or 44 ton articulated lorry, PVD members around the UK have the skills and equipment to clean everything from curtain-sides to chassis rails quickly and efficiently, keeping your fleet on top form. Whether you are looking to maintain the classic patina of a pre-war veteran or you want to enhance the enamel on an Edwardian, PVD members have the know-how to help, some even specialise specifically in classic cars. James has done an absolutely amazing job on the car considering the amount of abuse it gets (14k miles in 5 months and 5 track days! ), to the extent I now can't stop taking photos of it! I'll be back again for sure in the Spring and be recommending his services. After spending a bit of time looking around I finally had my X5 detailed by James from Ti22 Must say I'm very pleased with what James has done to the car. It now looks the nats !! Hi James, Just to say a huge thank you for the hard work and effort you have put into my car. I took the A8 into work today, and people have been blown away by the quality of your workmanship. I drive it now with an even bigger smile on my face! Thanks again!! "Hi James, thank you so very much for the simply excellent work that you carried out on my NSX. You have made an already wonderful car into an even more wonderful car. The paint work on the car was, as you know, tired and had swirls that I found impossible to remove even with my new Swissvax kit ! The car now gleams and has a depth of shine that I did not think possible. I cannot think of anything that I have ever had done to a car over a long history or car ownership that has had such a trans-formative effect. I am thrilled with the result. I cannot recommend your work more highly. I believe that the best service is provided by people who care about what they do and that is so true of you. I wish you every success and will return for a refresh next year. Great work on our 991 GT3, very professional and the products used perform well. Still admiring the work on the beast by Ti22 Vehicle Services Beautiful!! Full report and update on S4 coming to PistonHeads soon. I cannot quite believe the difference Ti22 Vehicle Services has made. Great work as usual James, I was really pleased with the job you did on my 1M. I will have to get my new car down to you at some point. Another 'big up' for James. He detailed my R8 last year and the attention to detail was unbelievable. Time for a return very soon now winter is done. James - Car has never looked so good! Top job! Worth every penny! I would like to say how fantastic a job you did on valeting my car last Friday. I have not seen it look so good for a long time. I shall certainly recommend you to all my friends and work colleagues. I booked Stuart to clean my Classic American car. I was extremely pleased with the results and his meticulous attention to detail. I would highly recommend Stuart and shall certainly be using him again. It is a pleasure to come across people who are specialists in their particular field and The Clean Car Company is such an organisation. Their attention to detail, products chosen and customer service are excellent - I would not use anyone else for our car fleet. Many thanks, our customer was expecting a large bill for body work, however Stuart worked his magic and removed some serous looking marks and restored the the colour and shine, the customer was very happy, we will be using this service again, many thanks Phil @ Twenty-Ten Engineering. Just wanted to say Thank you Stuart for such a thorough, excellent job you have done on my car today and the engine bay clean is superb, money well spent as far as I'm concerned , wouldn't hesitate in recommending you and your services. Cannot recommend Stuart and the Clean Car Company highly enough, My Alfa was suffering from swirl marks and following Stuart spending a day doing his magic with polisher and polishes it now looks as good as new. Well worth the money for a professional high quality service. Just wanted to say what a fantastic job you did on my car. Its so sparkly and gleaming it is certainly turning heads! So worth the money and I would recommend the same services to all my family and friends! Thanks again!!!! "He made my black car black again!" Despite being protected by a factory approved product, my black Mercedes didn't look quite as black as when I bought it. After a day spent in Stuart's care my car now look like a million dollars. I really do highly recommend The Clean Car Company with their professional and caring valeting services. Very professional and thorough job done, its the detail that make the difference. Good value and lasts for weeks. The raspberry smell inside is devine and also last for ages, not like those horrible so called "air fresheners" that you hand around your interior mirror. Also the fact that you go to the customer, thats a welcome change. Will follow up with maintenance washes! What a fantastic job Chris! So good that I had to take her out and show off your work! And boy, she did turn heads tonight! Thanks again, very happy!! Chris done a tremendous job on my 10 year old Landcruiser. I brought the car when it was eighteen months old and when Chris had finished the various stages of preparation and polishing, the car looked better than when I first got it. Another surprise awaits you when you find the old leather seating brought back to life, unbelievable!. If you want your vehicle meticulously finished then go to Pure Diamond Valeting. You will not be disappointed. Not often do you see a service provided with passion, with Chris that is exactly what you get along with a fantastic quality result. Thanks Chris! True pro! Fantastic!!! Will be using them again for our other car! I can't recommend SVV enough. Dave came out after only 24hrs notice, arriving promptly at the time agreed (and texting rather than knocking as it was 8:30am Saturday). We opted for the Solo Pre-Sale Valet and it was worth every penny. Dave worked without stopping for almost 6hrs - no hard to reach corner was overlooked, and our neglected car is transformed. Engine, Wheels, and Bodywork sparkling, and every inch of the interior super-clean and fresh. Fantastic service and a pleasure to deal with. Thank you very much! You couldn't ask for a better service. Although this is a car valeting company, Dave kindly agreed to shampoo the carpets in my house. He was polite, friendly, professional and my carpets now look brand new. If you are looking for a trustworthy company then I couldn't recommend Dave and SVV more. A master of his craft. I have to let people down now because I have experienced his work. A professional I will continue to use, regularly. I used SVV after being recommended to them. I was not disappointed. Dave arrived promptly on time at 8:30 in the morning (in fact he got there earlier!) and worked continuously throughout the day. He was highly professional and extremely precise with an obvious passion for the job. I would definitely request Dave's service again as I am really happy with the results of his work.